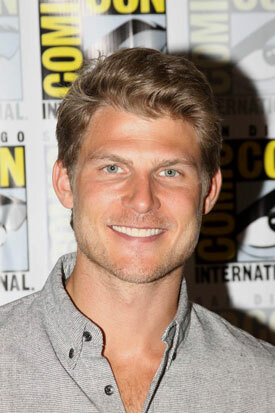 Travis Van Winkle from ‘The Last Ship’ at the 2014 San Diego Comic Con. Can you tease what’s coming up for your character? Do you have any military background in your family? Are we going to see more with that romance? They’re not in a good place right now. There hasn’t been a whole lot of death so far. But the main characters have all survived. Will it get grimmer before it gets better? What can you say about the finale? What influence has Michael Bay had on the show? Did he want you to play this particular role? How much of you is in your character? Is this your first Comic Con?